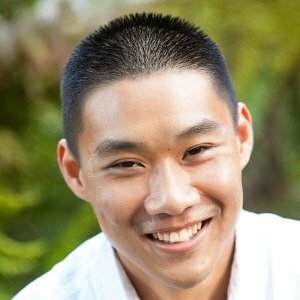 I was recently doing some work with the vSphere Content Library and I needed to extract some information using the Content Library API. I was hoping there were a few out of the box PowerCLI cmdlets but to my surprise, there was only one cmdlet called Get-ContentLibraryItem which did not get into the level of details that I was looking for, which was on a per-file level rather than item-level. I had also search the web to see if anyone had built any functions and although a few existed, none that did the very basics which was retrieving all libraries, library items and library item files. Before you can make use of these functions, make sure to connect to the CIS endpoint of your vCenter Server using the Connect-CisServer cmdlet. Although the granularity when using the vSphere Web Client is at a Content Library Item, using the Content Library API, you can get additional information on the Item itself which is then composed of a set of files. The following command will allow you to retrieve all Files or you can use -LibraryItemName parameter to filter on a specific Item. 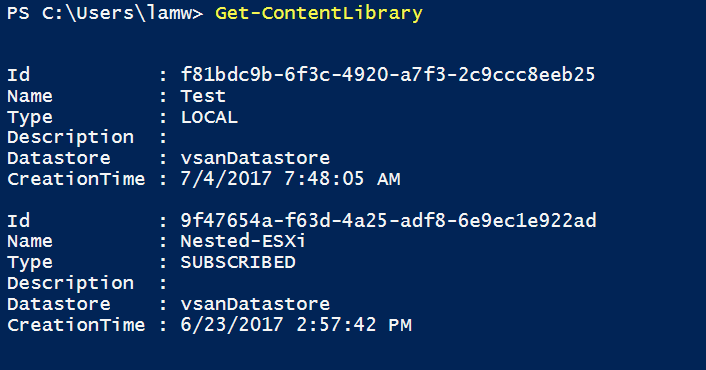 Converting a vSphere Content Library from Subscriber to a Publisher? Is there anyway we can convert the item in content-lib directly to usual template instead of converting it to the VM and the template because we use cloud-stack for our internal cloud which will see only items in VMs and templates folders and not in the content-library ..
I’m not sure if this is possible but, at my previous job, I had written a PowerCLI Script to take our templates once a month, convert them to VMs, install the latest windows updates, and then convert it back to template. I’d like to do something similar with the Content Library. I know the VM cannot be converted within the library, but are there cmdlets to export the VM from the library and download the OVA? From there I can script deploying the OVA into vCenter, installing the required updates, etc. I’d also need a way to delete the existing item in the Content Library and then import the new VM, replicate it, etc. Thank you for your work on this module. It gets me past a delegation issue I’m encountering when remotely running the default Get-ContentLibraryItem. But a new issue has arisen. Is there a way to get the object that comes back from the function to be in the ContentLibraryItem object type? Is there a way to see the total uncommitted size of the drives from the contentlibraryitem? I know we can get this information from a template and surprised it’s not available when importing to contentlibrary. I need this so I can calculate any over commitment before deploying the VM from the contentlibrary. This is great functionality, thanks. I’m trying to go a bit further. 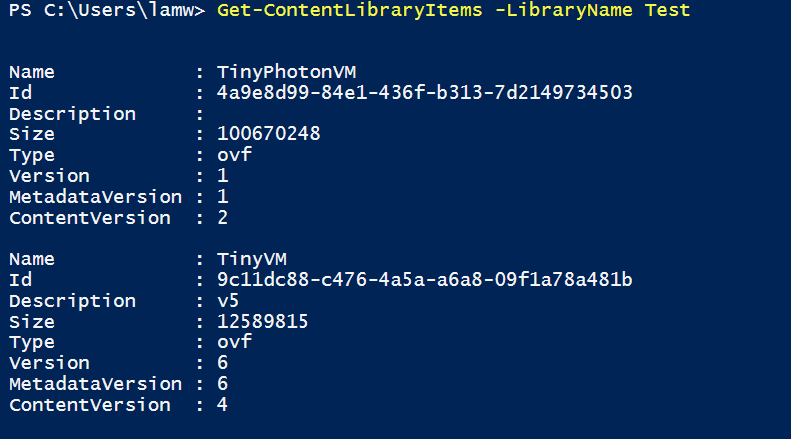 Any hints or tips on how I can add an OVA/OVF to the Content Library using PowerShell? Hi, is anyone getting this whilst trying to create a new subscriber library? Subsequent errors appear but only including the first. Method invocation failed because [System.Management.Automation.PSCustomObject] does not contain a method named ‘Create’. When I changed the $subscribeurl to point at the Local library https json linke, the create New-ExtReplicatedContentLibrary worked….